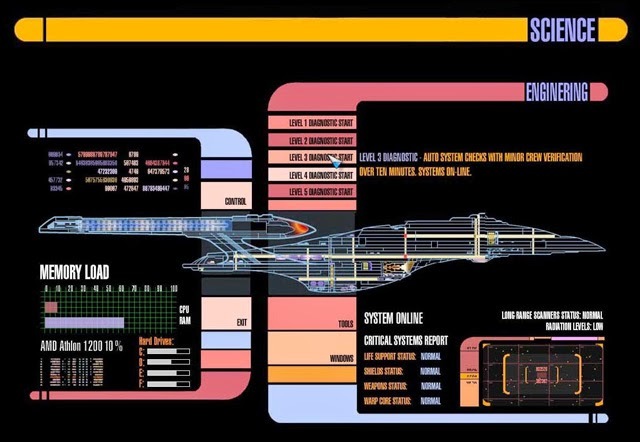 STAR TREK: Six Degrees of Separation to Lwaxana Troi | Warped Factor - Words in the Key of Geek. Everyone’s heard of the game Six Degrees of Separation to Kevin Bacon, right? Well I get bored easily and I spend way too much time alone with my laptop. So I started wondering - Is there anyone else that the Six Degrees game would work for? 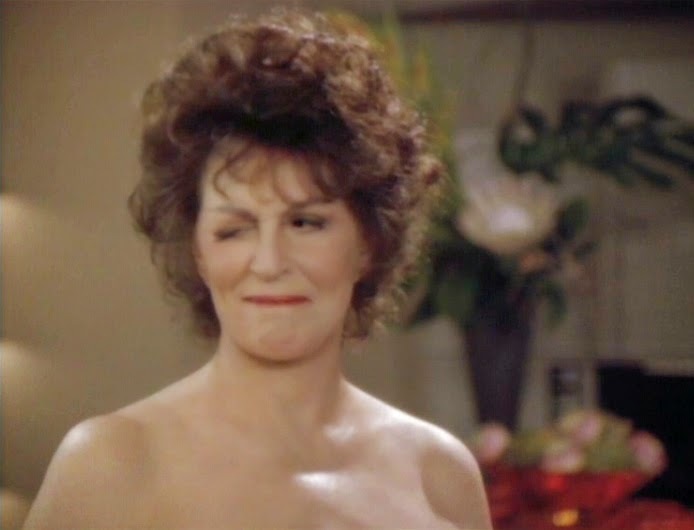 Of course the first person I thought of was Captain Kirk / William Shatner, but I don’t like to make life too easy, so I thought again, and the next person that jumped to mind was Lwaxana Troi, well Majel Barrett. Before I started, I decided there had to be some rules to this game. With Kevin Bacon, the rule is you have to stick to films, but that’s not going to work here, so the new rule is the person has to have been in the same film or episode with the next person. So, I tried to think of what film I should chose to start with. Okay, we’ve got a woman well known in the Science Fiction world, so let’s start with the first British Science Fiction film A Message from Mars (1913). Then I thought want about the other end of the spectrum, a new film, so I thought I’d start with most recent film I’ve seen which is Kingsman: The Secret Service (2014). Just so you know, as I write this I have no idea if this is going to work, though let’s face it, if it doesn't then this is going to be filed under “too embarrassing to submit”. Unbelievably it’s now 22:47, exactly one hour and I’ve done it! A Message from Mars starred Charles Hawtrey (1), as did Honeymoon for Three, which also starred Elizabeth Risdon (2), who was in Scaramouche, along side Elenor Parker (3) who was in Sunburn, with Joan Collins (4). Everyone knows she was in Star Trek: The City On The Edge of Forever, with Leonard Nimoy (5), who was also in Star Trek: The Cage, along with Majel Barrett (6). Taron Egerton (1) is in Kingsman: The Secret Service, which also features Corey Johnson (2), who was in X-Men: First Class, along side Micheal Ironside (3) who was in Starship Troopers, with Dina Majer (4) and she was in Star Trek: Nemisis, as was Majel Barrett (5), well her voice was, she’s the computer voice. Well, no, of course it doesn’t. Except perhaps that I need to find something else to fill my time with – must get back to that book I’m meant to be writing. Once started, I wondered what else could link. So I wondered about the first science fiction film that came to mind while I was driving and this idea come to me, Metropolis (1927). I have had a look, but the truth is, I just couldn’t find a way to link to Majel Barrett as they were all foreign actors and every time I thought I was getting somewhere, I hit a dead end, it didn’t help that I couldn’t recognise any of the foreign films, if I had I might have made a better fist of it, but someone out there may be able to find a way through the maze that baffled me. So how about something totally unrelated. I happen to be watching an Inspector Lynley Mystery, so what about Nathaniel Parker? Actually that was easier than expected. Nathaniel Parker (1) is in Stardust, as is Mark Strong (2). Who’s also in The Imitation Game with Benedict Cumberbatch (3), who played Khan in Star Trek Into Darkness with aplomb. Not surprisingly, Leonard Nimoy (4) was in that too as Spook Prime, which of course leads me back to Majel Barrett in any number of episodes from ST:TOS. So what about some Hollywood A-lister, preferably one who hasn’t been in a SciFi movie. This is the point where I run into trouble. Most of the films I know do have a SciFi bent. So I looked up at my DVD collection and it just so happens that on then end of one section is Jesus Christ Superstar. Well if that’s not as far from SciFi as you can get, I don’t know what is. So I looked up the film and its star, Ted Neeley, not exactly an A-lister, but let’s try it. Turns out, Ted Neeley (1), was in Django Unchained (I’ve not seen it, so I had no idea about that one). Samuel L Jackson (2) is also in that, so I could have gone the Kingsman route, which would have worked, but I decided to try something else and I found a quicker route, which would also have worked to shorten Taron Egerton’s path. Anyway, I went from Jackson to A Time to Kill. That was when I got the surprise. Ashley Judd (3) in A Time to Kill. 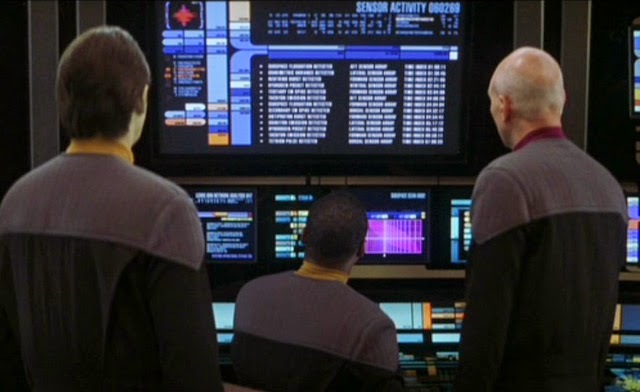 Judd played Ensign Robin Lefler in Star Trek (TNG): The Game. Anyone want to take a wild stab in the dark as to who played the computer voice? 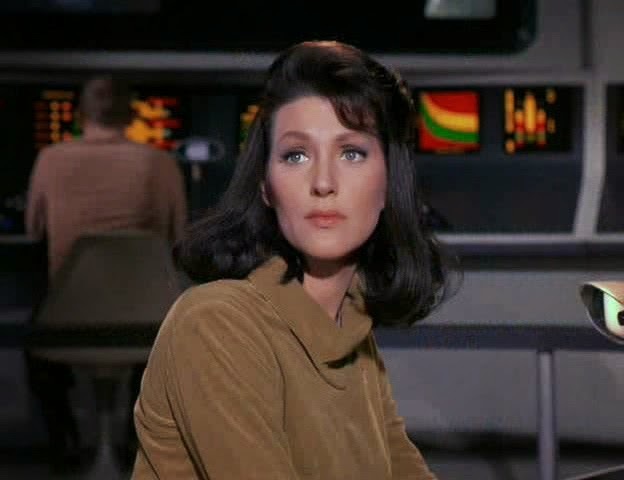 Majel Barrett (5). Then there’s the curve ball. Tragically we lost Geraldine McEwan (1) recently, so I thought I’d have a look. McEwan was in the series Mulberry with Karl Howman (2), who was in Hazell: Hazell Pays A Debt, which starred Nicholas Ball (3), who was also in the Hazell episode, Hazell Goes to The Dogs, with Marina Sirtis (4), who played Deanna Troy, Lwaxana Troi’s daughter (5), so pick any number of ST:TNG episodes. So there we go, with the exception of a foreign movie it works! 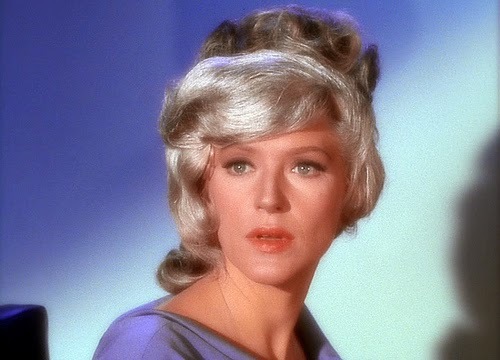 Unless you can you link Metropolis to Majel Barrett in 6 steps or less. Can you? Now I’ve set it running, the rest of you are free to try it. 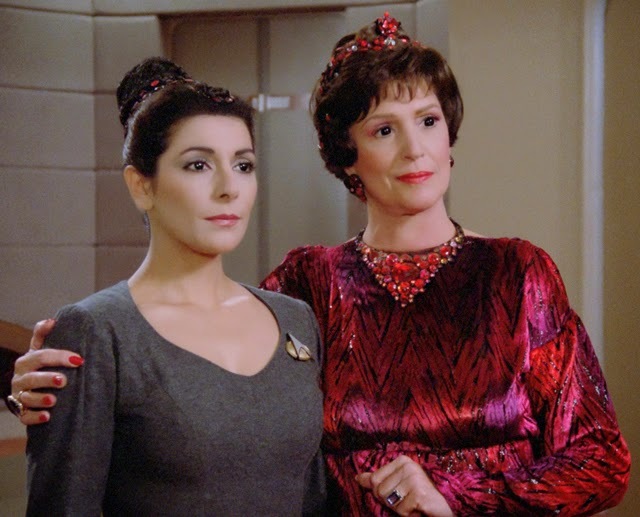 Go on, prove Lwaxana Troi is the centre of the universe, you know she already thinks she is.